Aleksei Pichugin congratulates and thanks those who regularly correspond with him and members of the Moscow Public Oversight Commission who have helped him immensely in resolving many important issues while he has been held in the capital’s highly secretive detention centre, where lawyers can, at best, see him once or twice a week. The staff of Novaya Gazeta and the portal HRO.org continue to maintain public attention on his fate. The results of the outgoing 2016 have proved disappointing. The list of political prisoners, compiled by Memorial Human Rights Centre (Moscow), has doubled. Yes, some of those imprisoned have been released. On a November evening, Sergei Reznik and Aleksei Gaskarov spoke out in support of political prisoners at the Sakharov Centre. But it’s far too early to say the political trials are over, indeed, there is barely a pause in these convictions. 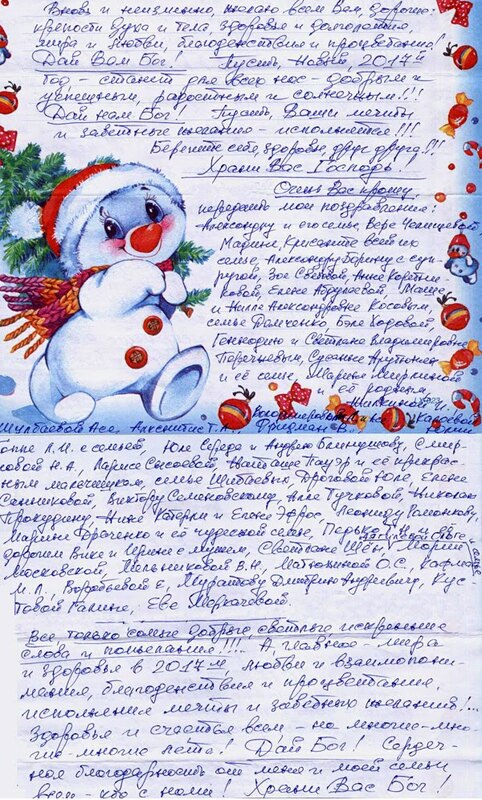 Aleksei Pichugin sends his letter in the days before New Year to those who have supported him for the past thirteen years. This number is shameful. His letter is full of light, soulful warmth, kindness. No complaints, not one shadow of anger or bitterness towards his persecutors. There are many words of encouragement. It’s as if we were the ones in prison, not him. He really is more free than some other people, such as those who are tormenting him, for example, people who are overwhelmed by fear and hate and despair. All those freed from incarceration say that what is of most importance for them is moral support from outside – in the form of letters and cards. The geography of support for Aleksei Pichugin is growing, and the list of those he asks to be congratulated and thanked already fills more than a page. Unfortunately, what is extremely clear – for those who have taken the time to find out – is that the falsity of charges does not affect the position of a political prisoner. It must be acknowledged that the author of these lines very much hoped that in its December session, the Committee of Ministers of the Council of Europe would finally look into the complaint of the former Yukos employee and his lawyers about the failure of Russia to implement the European Court of Human Rights’ judgement in relation to Aleksei Pichugin. Alas, the proceedings were postponed once again by the Committee of Ministers – they will now take place next spring, in March. The story with the Committee of Ministers is already entering its fourth year. Alla Nikolaevna Pichugina’s letter to Vladimir Putin, with a request to pardon her son, has still met with no reply. It only remains to wish Aleksei Pichugin – and all others that have been unlawfully convicted – that 2017 will turn out to be a just year. And that it will bring long-awaited freedom. But we must make an effort to achieve this – as far as is individually possible, and each in his and her own way.